For as long as humanity remains a violent and loathsome species there will never be a shortage of equally violent and loathsome thrash metal. For Teutonic thrashers Contradiction, what better way to inspire loathing than a sound byte of recent history's most divisive figure? Opening with a certain former president named George W. Bush preaching justice, a pulsating drum roll arrives, dragging in the abrasive opener 'Perfect Combatant.' Blessed by a charging tempo that races along to a jagged riff, 'Perfect Combatant' packs the kind of energy that will forever inspire bloody mosh pits. The music layered here comes from axe man Oliver Luxx' desperate wails with Oliver Kamper joining him on guitar, Andreas Wesphal on bass, and Christoph Zelp on the beats. It's no small feat for this tight lineup to have actually endured since the first album in the early 90's.Unfortunately, through almost two decades of existence Contradiction have barely registered among the global thrash legions. Rather surprising in light of the strong material from the album at hand. There's no reason to doubt then, fellow war freaks, for 'The Essence of Anger' is an hour of boiling tunes rife with violence and hatred. If you think Kreator's 'Hordes of Chaos' delivered mightily or Evile (RIP their bassist) had another thing coming on 'Infected Nations,' Contradiction elbows their way to equal prominence on this fresh platter of war ensembles. While the incendiary nature of the music may best be compared to napalm, rather inane lyrics that bring forth wholesome songs like 'Collateral Carnage' and 'Death Is Now' plague the album. But is this such a bad thing? Thrash fans are evidently well catered for throughout these 55 minutes of churning riffs, rather uninspired guitar solos, and rapid fire machine gun drumming. Peddling the familiar thematic cliches (pain, nihilism, warfare), Contradiction embellish their tracks with the sound of marching boots, venomous lyrical pronouncements, and�man, this is getting repetitive�riffs galore. There you have it, all the good stuff under the flag of Contradiction. Even the band's logo conforms to the thrash metal aesthete; large solid letters and pointy edges. Need this review plod on? If you're keen on Contradiction's frenzied approach to the genre the same way you are with usual favorites Legion of the Damned, Sodom, or Nocturnal Fear, then go ahead and buy 'The Essence of Anger.' It won't disappoint. Promise. 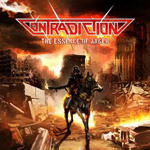 If you're keen on Contradiction's frenzied approach to the genre the same way you are with usual favorites Legion of the Damned, Sodom, or Nocturnal Fear, then go ahead and buy 'The Essence of Anger.' It won't disappoint. Promise.